Don’t own the game? 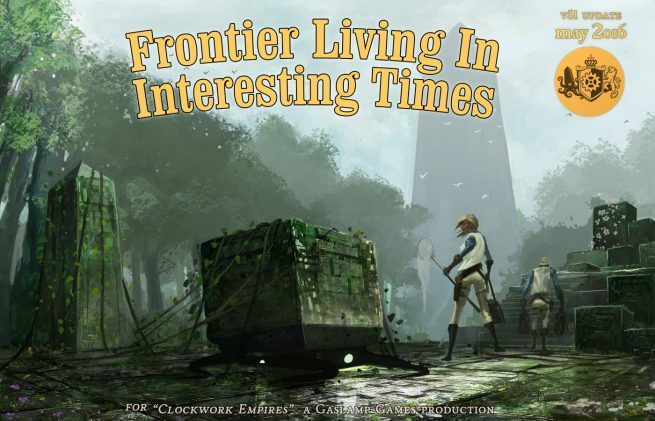 Clockwork Empires can be purchased on ClockworkEmpires.com via Humble or from Steam. Our top bureaucrats assure us that the stars are right and we must use the correct number so: Clockwork Empires is on sale via Steam for exactly 34% off on May 21st only. Not until great Quag’gorath awakens is it going to get better than this. We are moving from Alpha 50 to Beta 51. It starts with us: this is a shift in development. We have essentially finished all of the backend code required to complete the game. We can now switch entirely to mechanics integration, content implementation, UI/UX improvement, optimization, and stability. This also means that the countdown to release can be counted in months. This is an exciting threshold for us! Colonists can now carry stacks of ingredients to workshop jobs that require lots of materials – much more efficient! Begin the full Beta 51 changelog! implemented the first pass on the bricbrac system: Bricabrac can be crafted in most workshops using different resources, and is used to make decor modules. Decor now contributes an amount of quality to buildings based on its bricabrac cost. refactored emotion names to separate emotion names “anger, fear”, from actual moods “angry, afraid” which was making writing things really awkward. balance: middle class characters now start with one level of a random skill because it’s just more fun. FIXED: in certain rare cases people would attempt to intimidate a fishperson who died while they were running over to the fishperson. Now they don’t. military units will not immediately disband after the death of their NCO, but rather some other member of the crew will assume control. FIXED: faction relations now cannot exceed 100 on the scale of -100 to +100. Beautiful art work. Looking forward to more Progress of a Scientific Nature.